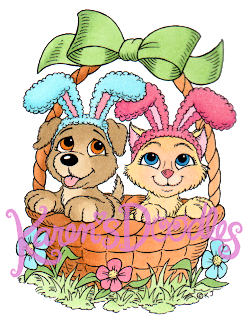 For each individual hop, visit all the participating members blogs between April 1st and April 3rd and you will find an Easter Egg with a number on it . Collect the numbers and add up the total. 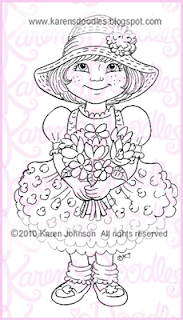 Be sure to leave a comment while you are visiting, as each Design Team member will be choosing one person from their comments to win the Karen's Doodles image they have used. 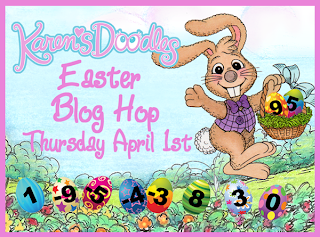 There will be 4 Grand Prize winners, one for each Blog Hop, chosen from the visitors who send in the correct total of the eggs for that particular Hop. 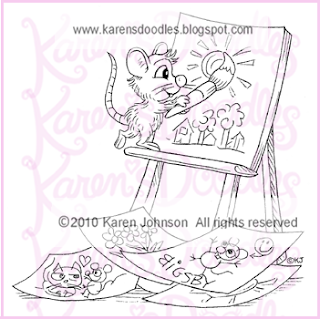 The winner will get their choice of 4 Karen's Doodles images. 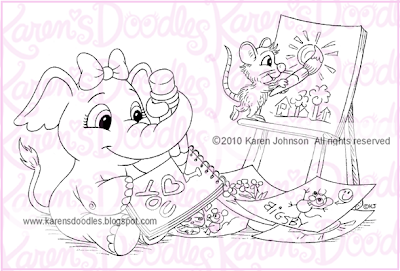 Karen's Doodles original piece of art. 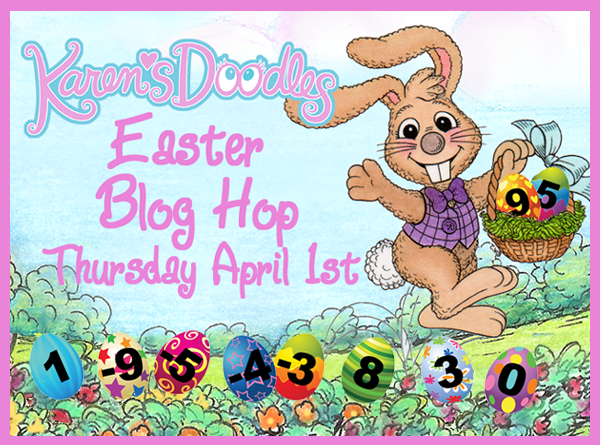 Just visit all 4 Country's blog hops, collect the numbers from the eggs and send the grand total to karensdoodleseasterbloghop@gmail.com The Hops will close on Saturday, April 3 at midnight EST. Winners will be announced on each Challenge blog before their weekly challenge. 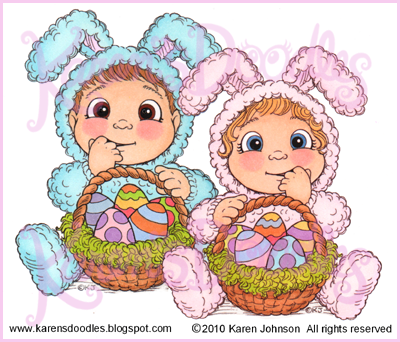 HAVE FUN and HAPPY HOPPING!!!!!! 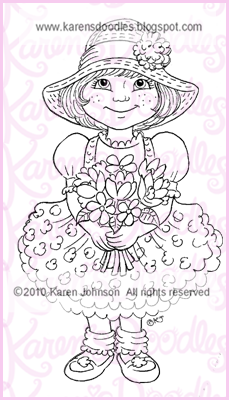 Congratulations to all who got this sweetie as a freebie. She is now for sale in my store. MORE NEWS! There is still time to enter ALL of our Challenges this week. You can enter all of them every week, you only need to enter a new card in each challenges! There are prizes for 1st, 2nd and 3rd place! Click on the links in the side bar to go to the challenge sites. BLOG HOP COMING NEXT WEEK ON ALL CHALLENGE BLOGS! 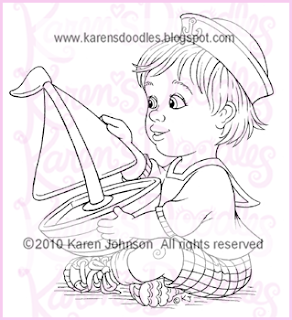 This little Sailor Boy is ready for the open seas :-) Enjoy! 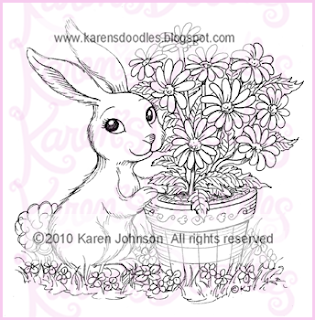 This pretty Bunny is just in time for Spring :-) Enjoy! This is a request from Ri :-) Don't you want to adopt this little Puppy? You can add your own sentiments to her Bone :-) Enjoy! 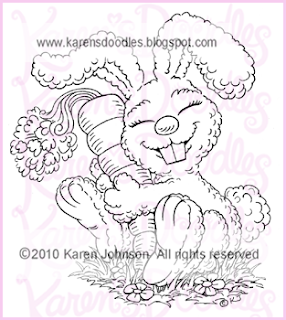 I hope this little Bunny bring you lots of happiness :-) Enjoy! 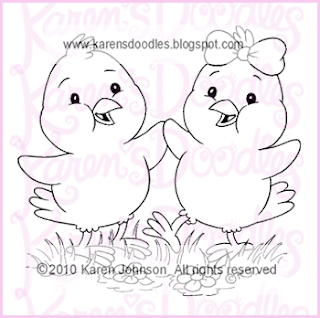 These twin chicks are named "Cheep" and "Penelopeep". They are the surprise ending in my book, "Oink Finds and Egg". I am also posting this picture in honor of my twin brother, Jim, who was the inspiration for my book. :-) It was our birthday this week and we have celebrated every single birthday together since we were born (That's A LOT of birthdays) LOL. Enjoy ! 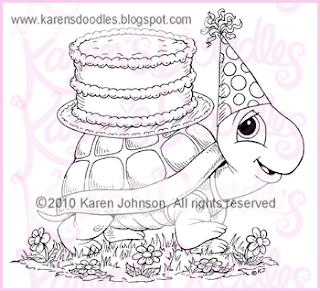 So many of you loved Herbert in Special Delivery, that you have requested a "Herbert the Turtle" Birthday Set. You can purchase each one separately or buy the Set and SAVE. Each file comes with a jpeg and a transparent PNG so you can layer the images in MS Word and other software. 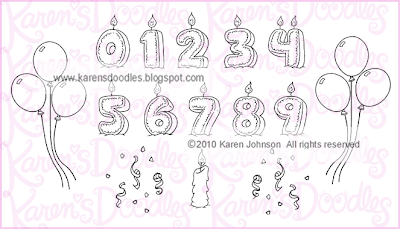 The Candle and Balloon set comes with 15 separate images so you can combine them easily! Enjoy! 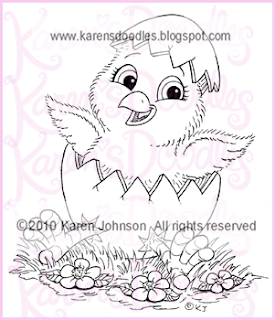 Here is a sweet little baby chick just in time for Spring :-) Well,,, maybe it's Spring for some of you, but here in Wisconsin we don't get Spring weather until June LOL! Enjoy this cutie! I am soooo excited! 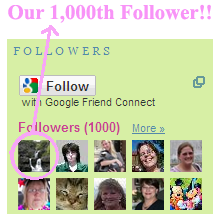 We have just reached 1,000 Followers! To honor this incredible Milestone we are going to Party with a BLOG HOP!! Details will be coming SOON! Our 1,000 Follower is Inspired By Friends. She is the lucky WINNER and will be invited to be a Guest DT for the month of April. BUT, That's not all....Our group on Paper Craft Planet reached 400 Members and our SNR Group is at 200 Members. Can you believe it??? 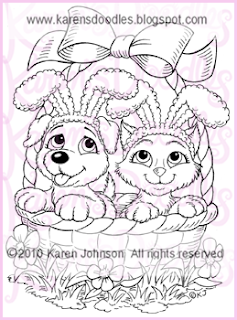 You can pick up this little Easter Puppy for FREE when you visit our groups on Paper Craft Planet and SNR Card Universe. Thank you so much for inspiring me to draw! Hugs to all of you! 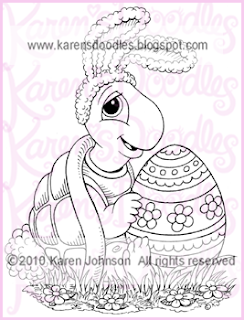 Here is our favorite little turtle, Herbert, trying to do the Easter Bunny's job :-) Enjoy! By request, a little Peekaboy Boy with his bum in the air :-) Enjoy! 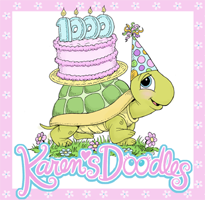 Announcing Karen's Doodles Kid's Challenges! What are you waiting for? Sharpen those pencils...get the paper, crayons and glue ready...the FIRST Challenge starts this Saturday :-) Whooo Hooo! Let the KID FUN begin!!! 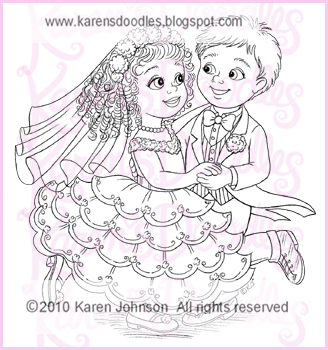 The wedding was perfect...the bride with her beautiful wedding gown and flowers in her hair- the handsome groom when he put the ring on her finger and they both said their wedding "bows" ..."I Do!" You can enter all 4 challenges, as long as you create a new card for each Challenge. 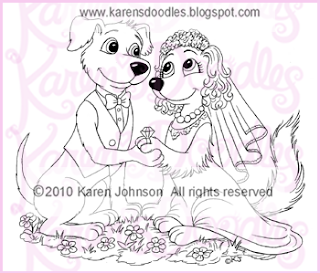 To Honor this event, we are having a DIGI STAMP SALE. 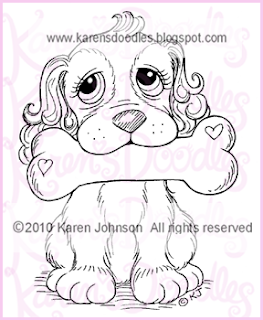 This is the chance to stock up on Karen's Doodles images for use in all the great challenges yet to come. The challenge rules are listed on the right sidebar of each blog. 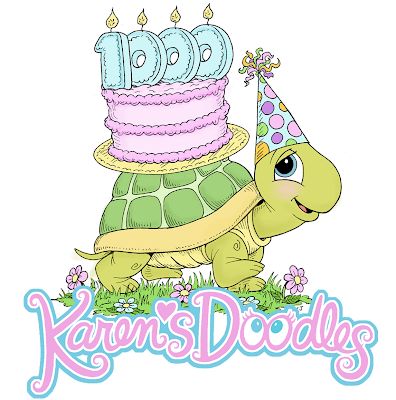 To enter the Challenge, you MUST use a Karen's Doodles image. 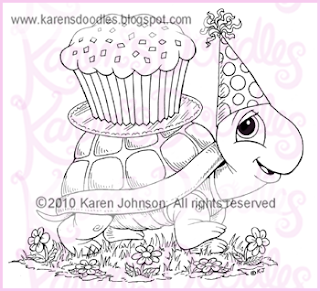 If you belong to our Paper Craft Planet group, you can also pick up a freebie image to use. Please read the rules and follow them closely. For our first Grand Opening Challenges, we have a BONUS PRIZE for the 1st place winner. All winners will be chosen by Random.org. The first Challenges will close on Sunday, March 14th at midnite EST. Winners will be announced before the next challenge. Good Luck to everyone and Happy Crafting! Georgia and several others from our groups on Paper Craft Planet and SNR requested a Bride and Groom. 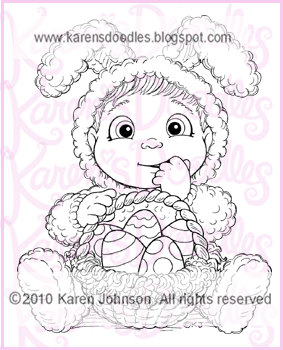 I thought I would draw something a little fun and lively :-) Enjoy! 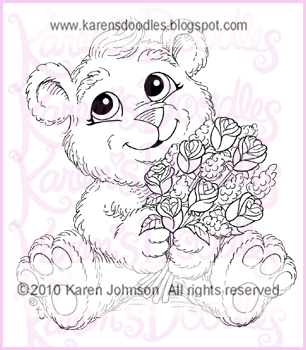 Another version of a little Flower bear :-) Enjoy! 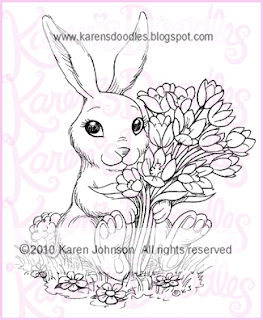 After many requests, here is a sweet little boy bunny :-) Also included in the file is a flipped version of the Bunny Boy so you can combine him with Bunny Girl. This image was created in MS Word. I imported the PNG images with transparent backgrounds and then reduced the size of the girl just a little. Aren't Digi's Fun? This little cutie was a request from Tanya, a member in our Paper Craft Planet Group. Tanya said, "My little girl is 11 months and has just learned to walk. She made me laugh the other day as she bent over she realized she could look through her legs, and see us. Well, since then that's all she does LOL. I think they look so cute when there little bum is in the air"
Tanya, here is your daughter with her little bum in the air :-) Enjoy! The DT Teams for our New Challenge blogs in the US, UK, Scandanavia and the Netherlands have been chosen. :-) I would like to Thank all of you who applied for the teams! We received so many wonderful submissions that it made the final decision a very difficult task. You can see the new DT Members listed on each Challenge blog and be sure to follow each blog for their upcoming Challenge dates.